You are away from home and you will not be back anytime soon. Or you are a business owner who travels frequently for extended periods of time. Shipping packages or forwarding mail items to your current location could be quite expensive. You definitely want to save this money one way or another. PostScan Mail’s mail and package consolidation is a convenient and cost-effective solution. Instead of shipping items separately, combining items and shipping them as one is much more cost-effective. 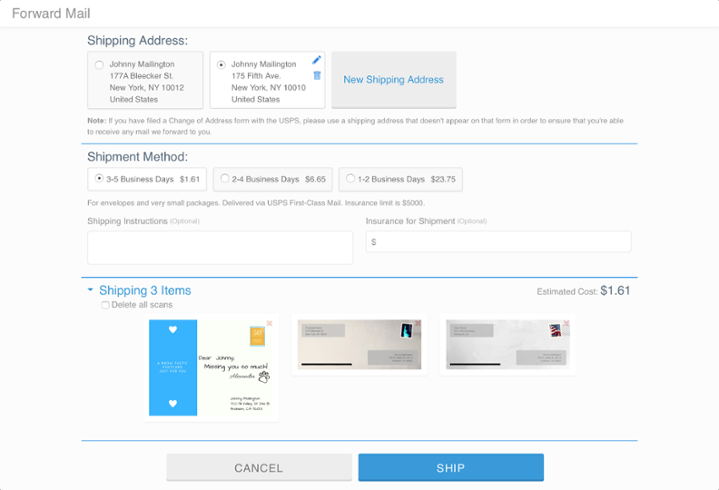 If you ship items separately, you will pay shipping fees for each and every one of them, while shipping five items together means you pay those shipping fees only once. You might ask your neighbors or friends to ship your items for you but you would not like paying for shipments only to receive junk mail along with other items. While your neighbors might be unavailable, PostScan Mail’s mail ninja team is there for you all the time. They will sort you mail and help you get what really matters in the most convenient and -efficient way. sort your and send you scans of envelopes and packages you have received. Once you view your mail through your personal account and you decide to forward multiple items to an address you choose, they start by packing together your items and sending them as one. This considerably lowers your shipping fees and keeps your items together. Registering to our virtual mail services allows you to view, handle, and manage your postal mail items remotely through your secure online account. You will no longer have to beg anyone to drop by your house to collect your postal mail. Once you sign up for PostScan Mail’s virtual mailbox, the facility takes care of your postal mail. When your items reach the facility, you receive an online notification and then you can decide whether the item should be shipped right away or whether it can wait and be shipped with other items for cost-effectiveness or whether you wish to store it at the facility free of charge. Viewing your received mail items through online alerts will make you able to better decide which items deserve immediate attention. Register now and join our happy users who stopped worrying about their mail anymore. Put our service to the test with a 30-days free trial and enjoy an automated, digitized service that shall transform the way you ever handled mail.